Sleek, tankless, one-piece toilet with integrated Washlet seat. New Cyclone Flushing system, no waiting for refill, no refill noise. Integrated Washlet features front and rear warm water washing, automatic air dryer and deodorizer. 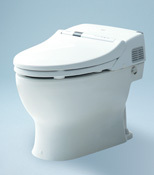 - Automatic Operation: Lid opens, closes and toilet flushes when sensor is activated. 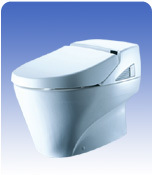 Sleek, tankless, low profile elongated one piece toilet with integrated Washlet. Low consumption (6 Lpf/1.6 Gpf) Cyclone flushing action. SanaGloss glazing. 12" rough-in. Tank cover, fittings, mounting covers and Washlet included. SanaGloss: Super smooth, ion barrier glazing cleans your toilet bowl with every flush. Electrical service requirements – 120 VAC, 10A, 60Hz protected by Class A GFCI.